You just want to have clear, blemish-free skin but the appearance of pimples and acne is leading to loss of confidence, insecurity and emotional stress. Topical creams formulated with azelaic acid are here to help when it comes to acne. They are applied directly on the affected area, to help you get that clear skin you’re dreaming of. The skin produces an oily substance known as sebum that lubricates the hair and the skin. Excessive production of oil can cause build-up on the hair follicles. Oils and dead skin cells clog the pores and form a plug that attracts bacteria. The bacteria populates the affected area, causing inflammation. If your skin is repeatedly affected by this condition, you may have acne. The clogged pore may result in the creation of a follicle wall that bulges and produces a whitehead. This may darken to a blackhead. The pores are congested with bacteria and oil which causes pimples – raised red spots with a white center that develop, becoming inflamed or infected. Acne may appear on different parts of the body, including your face, neck, chest, back and shoulders. The reason for this is that these are the areas of the skin that have the most oil (sebaceous) glands. Azelaic acid is a naturally occurring acid. It helps the skin to renew itself quickly and helps reduce pimple and blackhead formation. This supports the skin to kill the bacteria that cause acne and rosacea. There are many azelaic acid creams that are available over the counter and do not require prescriptions. The creams have anti-bacterial, anti-inflammatory, and exfoliating properties, making them a great product for acne and rosacea problems. 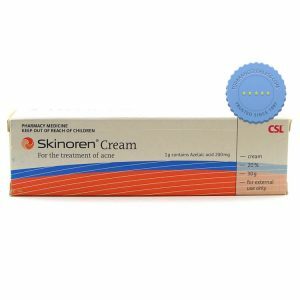 Skinoren Cream is an effective anti-acne topical cream. It works by treating acne with azelaic acid to eliminate acne causing bacteria. This fights existing acne and helps stop new acne from forming. Every 1g contains 200mg of azelaic acid to help prevent the formation of pimples and blackheads. You can buy this over the counter, to relieve you from your acne problems. Head to our webstore to browse this and other acne products.